The existing building is located in Pergine Valsugana (TN). It was built in 1922 to become an oratory for girls and youth center. In 1950 the entire building was raised up with an additional floor. At present, the total treated floor area, 840 m², is divided in three above ground floors and one basement floor. The building is characterized by a compact “T” shape with massive external walls. The wall assembly for the first two floors is made up of local stone and plaster, the third floor built later is in hollow brick. The horizontal elements (ceilings and roof) are mainly realized with timber. All construction elements have no thermal insulation incorporated. The oratory is located in the urban center. The surrounding buildings provide heavy shading, especially on the south facade, limiting considerably the solar gains. The existing windows are single glazed with uninsulated timber frames. The building is primarily heated with two boilers connected with two air handling units (AHU). In addition there are wood stoves in some rooms. The hot water is provided by small electric boilers. The renovation concept is about the addition of a new volume; the total existing building will be mirrored on the north-south axis. All the structural elements (walls, ceilings and foundations) have to be reinforced in order to respond to the new Italian seismic legislation. 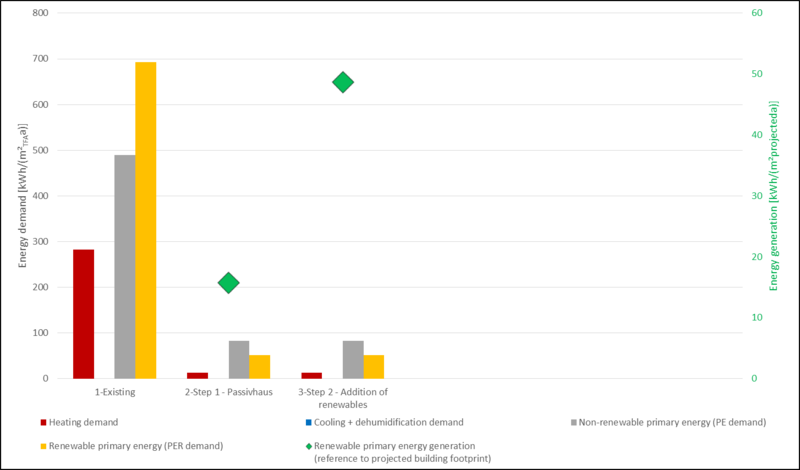 The energy retrofit aims to the Passivhaus standard for the all building (existing and extension). It foresees the thermal insulation of the opaque components of the thermal envelope. All the transparent components will be replaced with high energy performance windows (low-e triple glazing filled with argon) and doors. A new technical room is planned in the basement of the building. The ventilation will be provided by 12 ventilation units with heat recovery. A large ventilation unit in the basement will serve the majority of the basement and of the first floor, the other 11 ventilation units are much smaller and are disposed in the first, second and third floors. They provide the ventilation for the remaining parts of the building. Heating and DHW will be provided with district heating. In terms of renewables PV panels will be installed on the roof. A second step to be possibly implmented after the end of the project forsees the addition of facade integrated PV panels. 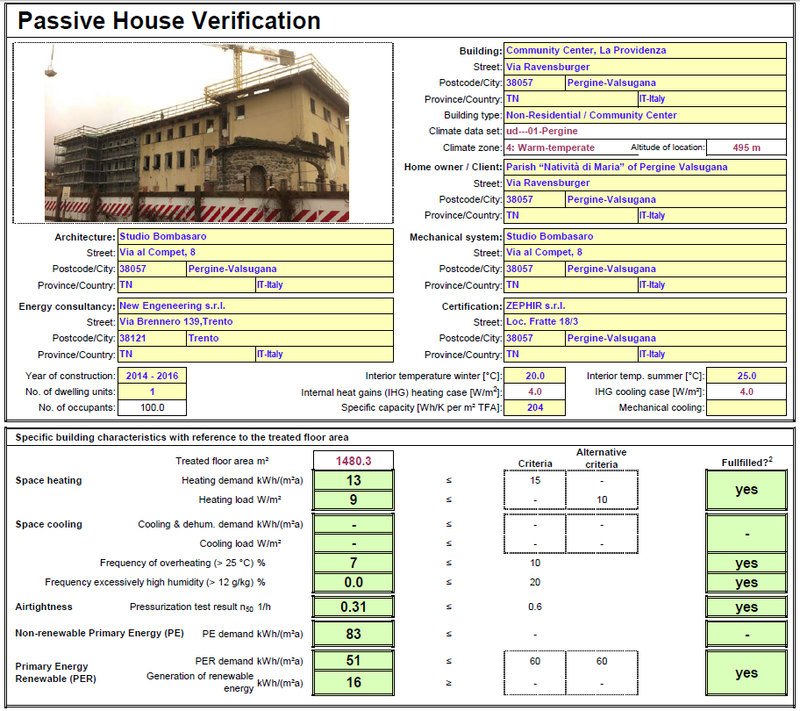 The Passivhaus Standard has been achieved after the implementation of the 1st retrofit. The 2nd step foresees the addition of renewables, more precisely PV panels on the south façade and on the roof. The main challenge of the project is the fact that the south facade is strongly shaded reducing considerably the solar gains of the building. Another challenge is the solution of the ground thermal bridges. In this specific project the most critical areas are the connection of the external walls and of the load bearing walls with the floor slab of the basement floor. Finally the solution of the airtightness at the connection between the external wall and the wooden beams of the floor ceilings represents another challange.